The following terms and conditions apply to all design services offered by Pink Lemon Branding & Design Ltd.
By requesting services from Pink Lemon Branding & Design Ltd you are agreeing to the following terms and conditions. 50% deposit is required before any project commences. All invoices are due and payable upon receipt and must be paid NO LATER THAN 7 DAYS of the date of invoice unless otherwise stated in the contract. Payment by bank transfer will only be accepted. Pink Lemon Branding & Design Ltd reserves the right to withhold final design files or withdraw all web pages until full payment has been received for a project. Any payment returned by the bank will incur an administration charge of 1.5%. This will be invoiced and added to the outstanding debt owed by the Client. Pink Lemon Branding & Design Ltd also reserves the right to change prices at any time without notice. However, if a Client has already commissioned any services from Pink Lemon Branding & Design Ltd prior to any change in prices, that commission will not be subject to any increase, but any subsequent commission may be subject to an increase. Pink Lemon Branding & Design Ltd owns the copyright of all content, materials, logos and design elements from within www.pink-lemondesign.co.uk, unless otherwise stated. These elements may not be copied, reproduced, rewritten, published or altered in any way without written permission from Pink Lemon Branding & Design Ltd.
On completion of any commissioned design work, full copyright is passed to the Client once payment has been received in full. However, Pink Lemon Branding & Design Ltd retains the right to use the final artwork in any portfolios or for marketing/advertising purposes, both on and offline. Client agreement will be requested beforehand. The copyright of any earlier concepts or design ideas that may have been supplied to you to preview remains with Pink Lemon Branding & Design Ltd. Pink Lemon Branding & Design Ltd retains the right to use such initial concepts in future projects and also reserves the right to use stock images in the creation of designs if required. Costs of this will be outlined to the Client prior to purchase. The acceptance of a project shall be deemed as a contractual agreement between the Client and Pink Lemon Branding & Design Ltd. We cannot always guarantee to start work immediately on a project but will inform the Client of estimated timescales upon acceptance of the project. Photographs, images and text supplied by the Client must be the Clients own or licensed for use by the Client. Pink Lemon Branding & Design Ltd cannot be held responsible for any breach of copyright or any other right caused by reproduction of materials supplied by the Client. The copyright for all material provided by Pink Lemon Branding & Design Ltd such as graphics, photographs and text, will remain the property of Pink Lemon Branding & Design Ltd until full payment has been received. All text and images to be used within the design work is to be provided by the Client. Costs for design services will be set out in writing to the Client by Pink Lemon Branding & Design Ltd. The Client agrees that any changes required over and above what is initially agreed will be subject to additional charge. This charge will be at an hourly rate of £50.00. Where proofs of work are supplied to the Client for approval, Pink Lemon Branding & Design Ltd accepts no responsibility for any errors not detected or clearly marked by the Client. In cases where matters including style, type, or layout are left by the Client to the discretion of Pink Lemon Branding & Design Ltd, any subsequent change in specification including authors’ amendments made by the Client will be charged additionally. A revision is any change whatsoever to a concept or design once it is presented. Pink Lemon Branding & Design Ltd encourages the Client to take as much time (no more than 14 days) to deliver accurate feedback on a design. If Pink Lemon Branding & Design Ltd is unable to contact the Client and the Client does not contact Pink Lemon Branding & Design Ltd via e-mail within 14 days after a concept or revised layout has been presented, then the project will be cancelled and subject to the conditions set out in this document regarding cancelled work. All revision requests must be submitted via e-mail. Although the Client is welcome to request revisions over the phone, Pink Lemon Branding & Design Ltd cannot guarantee accuracy of revisions unless the Client requests them via e-mail. If the Client wants to change the project after acceptance of the proposal, the Client will need to send Pink Lemon Branding & Design Ltd a written Change Order describing the requested changes in detail. 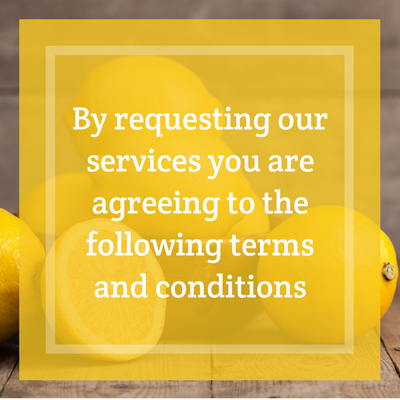 Within 14 days of receiving a Change Order, Pink Lemon Branding & Design Ltd will respond with a statement proposing my availability, additional fees, changes to delivery dates, and any modification to the Terms and Conditions. Pink Lemon Branding & Design Ltd will evaluate each Change Order at its standard rate and charges. If the Client requests are at or near 20% percent of the time required to produce Deliverables, or the value of the proposal, Pink Lemon Branding & Design Ltd will then be entitled to submit a new and separate Proposal to the Client for written approval. Pink Lemon Branding & Design Ltd will not begin work on the revised services until Pink Lemon Branding & Design Ltd receives a fully signed revised proposal and any additional fees. If the Client requests are not Major Changes, then the Client will be charged on a time and materials basis at our hourly rate of £50.00. Such charges shall be in addition to all other amount payable under this Agreement, despite any maximum budget, contract price or final price identified. Pink Lemon Branding & Design Ltd may extend or modify any delivery schedule or deadlines in the Agreement as may be required by such changes. The Client will have 14 days to respond in writing accepting or rejecting the new proposal. If the Client rejects the proposal, Pink Lemon Branding & Design Ltd will not be obligated to perform any services beyond those in the original proposal. Pink Lemon Branding & Design Ltd shall use all reasonable efforts to meet the Work Plan and Milestones delivery schedule. Pink Lemon Branding & Design Ltd may extend the due date for any Deliverable by giving written notice to Client. The total of all extensions shall not exceed 20 working days. The Client shall use all reasonable efforts to provide needed information, materials and approvals as per the Scope of Works. If there are any delays by the Client then the Client will need to notify Pink Lemon Branding & Design Ltd in writing within a reasonable timeframe. If however the project has been delayed for over 5 days without any notification then a payment charge of 8% (of the total project) will be added to the final balance. If the Client does not make contact and the delays result in 30 days then Pink Lemon Branding & Design Ltd reserves the right to cancel the project. All monies paid will be non-refundable and any costs outstanding (as per the proposal) will be due to be paid as per the agreed payment terms. Any delays caused due to conditions beyond Pink Lemon Branding & Design Ltd’s reasonable control, shall not be considered a breach. Pink Lemon Branding & Design Ltd shall use reasonable efforts to notify the Client, in writing, of a delay. Conditions beyond my reasonable control includes (but are not limited to) natural disasters, acts of government after the date of agreement, power failure, fire, flood, acts of God, labor disputes, riots, acts of war, terrorism and epidemics. Either party may terminate this agreement at any time. Any monies paid to date will not be refunded and any costs outstanding (as per the proposal) will be due to be paid as per the agreed payment terms.